Take off on a wild ride and never lose your cool in skinny-fit jeans made from panels of light-stretch denim with zippered hems that work well with your favorite boots. Zip back pockets keep your wallet and other personal items secure as you go. 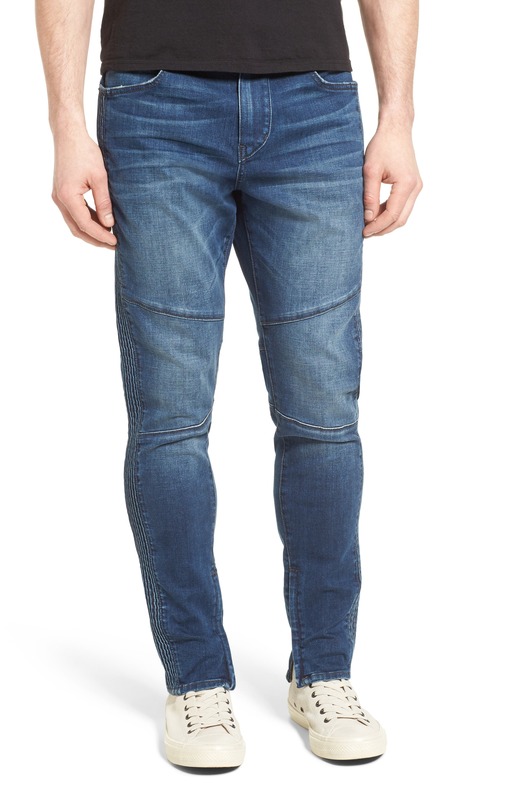 Style Name: True Religion Brand Jeans Racer Skinny Fit Jeans (Whiskey Blues). Style Number: 5360434. Available in stores. Married couple Jeffrey and Kim Lubell have combined his classic rock looks and her hip-hop and R&B style to produce their "True Religion," a transcending denim line made to exceed consumer's expectations of designer denim apparel. The brand has gained an impressive list of celebrity clients including Sharon Stone, Cameron Diaz, Justin Timberlake, Jessica Simpson, Ashlee Simpson, Gwen Stefani, Will Smith, Jada Pinkett Smith, Velvet Revolver, George Clooney, Ben Affleck, David Beckham, Sting, Faith Hill, Britney Spears, Jennifer Garner, Kate Hudson, Steven Tyler, and Robbie Williams. Nordstrom now offers free shipping. Free returns. All the time.